Before pinterest I saved a photo of an absolutely amazing wreath. It was apple greens and golds and whites. It was a texture lovers heaven and I loved it. This year while I was trying to figure out what I wanted my Christmas decor to be like, you know theme, colors or whatever, that wreath kept popping into my head. I loved how it was definitely festive but not traditional. I don’t know about you but I wanted to pick a theme that I would love in the future or that could be easily tweaked to work in a lot of themes just so all the decorations I spend my time making this year can be reused. I’m so happy that I went with apple green, gold and book pages. I’ll show you more picks of my other decorations which are still a work in progress another time but today I want to show you my wreath because I love how it turned out. 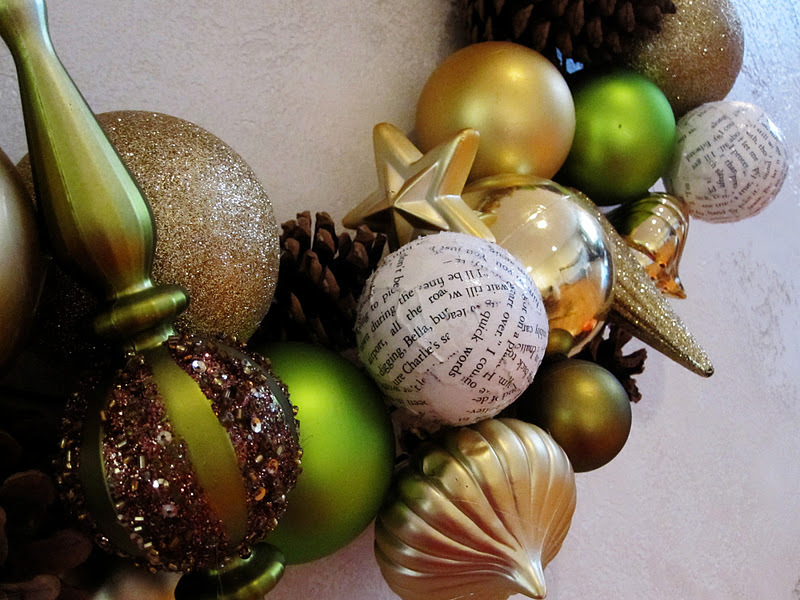 This (above) was the inspiration wreath. I don’t remember where I found it since it was before pinterest but if anyone does please let me know since I’d love to credit the creator of this masterpiece. 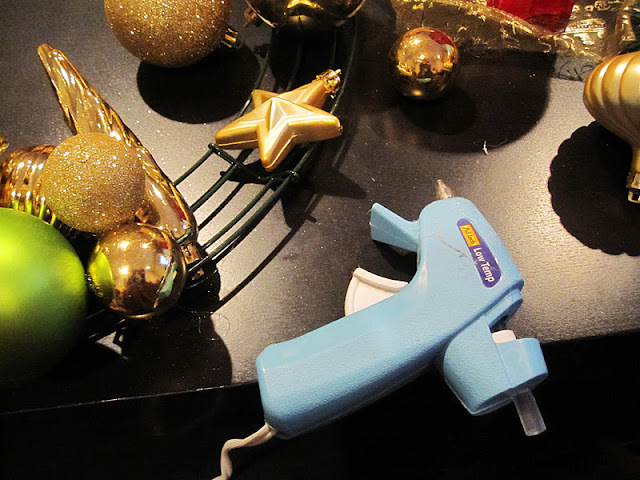 To make the book page ornaments just tear your pages into small pieces and paint a bit of mod podge on the spot of the ornament you want to work on then put a piece of the page paint a layer on top of that and repeat until the ball is covered. This takes a while and your fingers will get coated but it’s easy. When it’s done put a thick layer of mod podge on and sprinkle glitter all over. Let dry then spray with a coat of clear spray paint to try to keep the glitter a little more in place (it won’t be perfect but it’ll make it so that less of the glitter falls off). 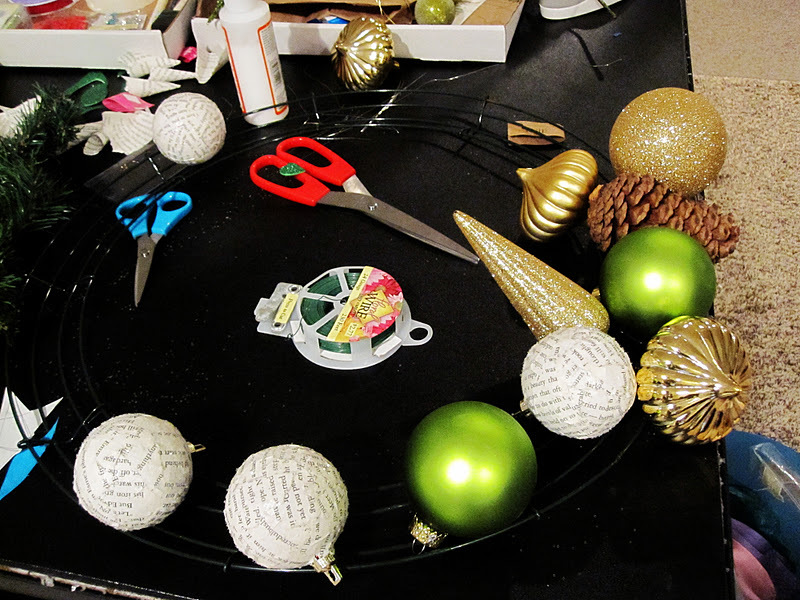 Lay out the ornaments around the wreath form so you get the general idea of how you’d like the layout, what ornaments you like next to each other, etc. Start gluing. Just glue to the metal frame. Keep adding pieces by gluing to the frame and to the pieces already attached to the frame. Repeat until nice and full. Yup it’s really that easy. Fill in any spots. String a piece of ribbon through the frame in back and hang. So that’s what I’ve been up to. As always if you try this out or if you’ve got something you’re proud of I’d love you to share it and link up at my What We Wore and Made party. It’s so pretty! I am a big fan of hand made pieces, and you did such a sweet up-grade to this wreath! Lovely outcome, thank you for inspiration! 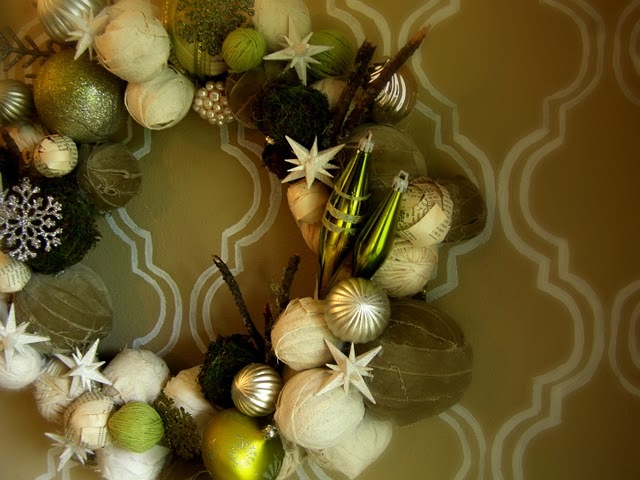 I looove this wreath!! Nice job! I definitely think book pages add such a beautiful touch to projects. This is very pretty. I have the same colors at home & was trying to figure out what to do with all the extras I have. I just may give it a try. Sooo awesome.. I LOVE this : )) VERY PRETTY!! best ornament wreathe i’ve seen so far. Oh wow!!! You did an amazing job! Lovin’ everything on it! 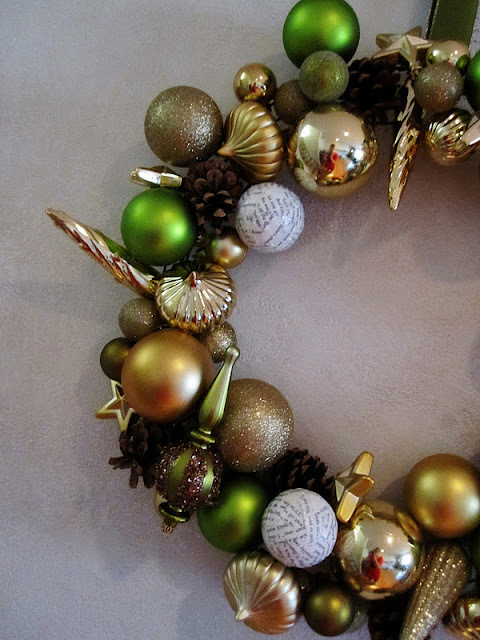 what a beautiful ornament wreath! This came out so beautiful. I really must try this next year. Thanks for sharing! Please share this wonderful post by joining our linky party, What’s it Wednesday this week. I hope you can join us. Have a fabulous Christmas! Awesome! I totally love it! 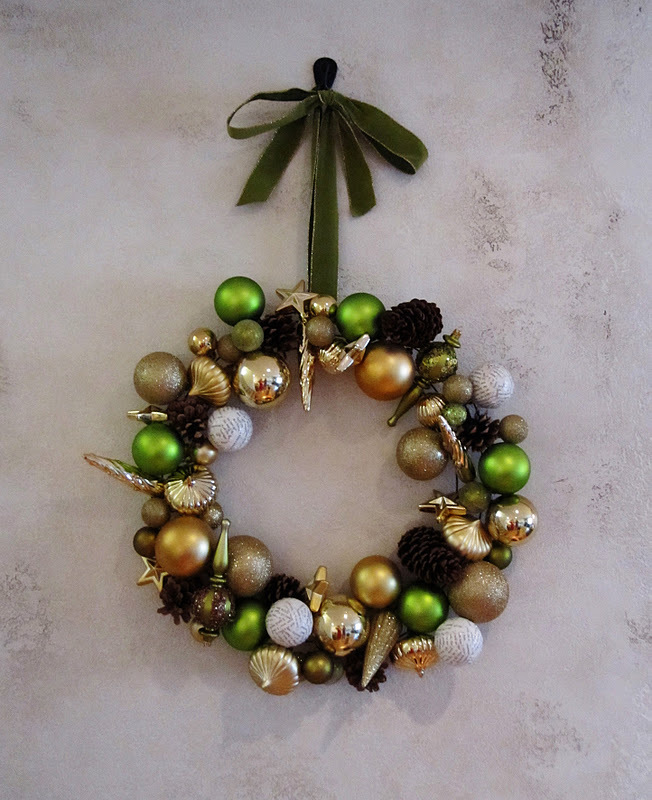 I’ve made an ornament wreath, with all similar, round ornaments, but I really love this one with all the different things on it! I love this project. It’s gorgeous with a great tutorial! I’m hosting a homemade holiday party with prizes and I think this project would be a great one to share. I’d love if you’d stop by. Oh I wish you could have heard me when I first came to your post and clicked “in it” “I like it a lot. I like it a lot. I like it a lot.” You see, I am compiling a collection of lovely wreaths for a post on Ducks n a Row this week. Yours will definitely be one of them. 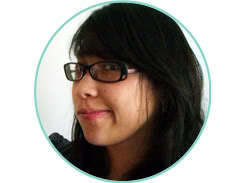 Found you, by the way, on my Wonderful Wednesday Blog Hop, So glad I did. Have a great day and keep your eyes out for my wreaths post. Hope to have it up no later than Saturday.